I was looking through some completed deals and it struck me how many had been declined for business finance before they came to us, and how many we were still able to help. 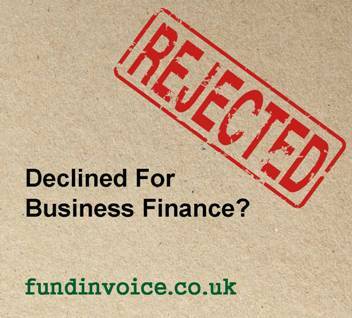 In fact, we specialise in being able to help when you have been declined for business finance elsewhere. Often we have been able to assist companies who think that there are no options available to them. It is often a case of knowing where to look. IT security design business - they were looking for export invoice finance for a debtor in Africa. The debtor was not worthy of a credit limit so receivables finance was not an option. As an alternative, we found them a substantial business loan so that they could still capitalise on the sales opportunity. A recruiter in the care sector - they had an existing invoice financing facility but the credit limit was removed on their prime debtor reducing their funding dramatically. We found them someone that would fund the debt, based on some additional security, without a credit limit on the debtor. Wood import and export company - their modus operandi meant that invoices were raised before goods were received - usually a problem in the receivables financing sector. This had caused other funders to reject them. We found them a combined deal with an invoice finance and a trade finance facility, overcoming the problem. Mobile phone repairer - who wanted invoice finance to purchase stock for expansion, but due to extended credit taken by customers, invoice financing was not possible. They also had the option of undertaking an acquisition for which we were able to source them a substantial business loan. Recruiter dealing with RPOs - they had only been able to find one financier that would fund their RPO debtors, and that funder wanted a substantial minimum fee, which would have eaten into their margins. We put them in contact with a specialist provider that offered the funding without any minimum fees at all. If you have been declined or rejected for business finance please call Sean on 03330 113622 as we may be able to help you where others have failed.